The Conservative Case for Education argues that educational thinking in English-speaking countries over the last fifty years has been massively influenced by a dominant liberal ideology based on unchallenged assumptions. Conservative voices pushing against the current of this ideology have been few, but powerful and drawn from across the political spectrum. The book shows how these twentieth-century voices remain highly relevant today, using them to make a conservative case for education. Written by a former government adviser and head teacher, the book focuses on four of the most powerful of these conservative voices: the poet and social critic T. S. Eliot, the philosopher Michael Oakeshott, the political thinker Hannah Arendt and the educationist E D Hirsch. In the case of each thinker, the book shows how their ideas throw fresh light on contemporary educational issues. These issues range widely across current educational practice and include: creativity, cultural literacy, mindfulness, the place of religion in schools, education for citizenship, the teaching of history and Classics, the authority of the teacher, the arguments for and against a national curriculum, the educational response to cultural diversity, and more. 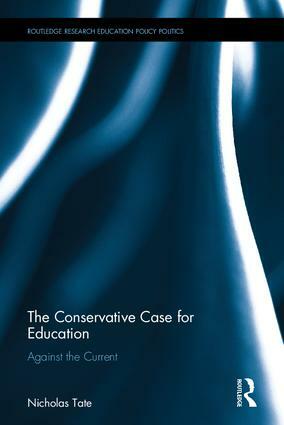 A concluding chapter sums up the conservative case for education in a set of Principles that would be acceptable to many from the Left, as well as the Right of the political spectrum. The book should be of particular interest to educators and educational policy makers at a time when ‘conservative’ governments are in power in the UK and the USA, as well as to researchers, academics and postgraduate students engaged in the study of educational policy, or those studying educational issues from an ethical, philosophical and cultural standpoint. "As a (small-c) conservative in education, allies are few and far between, and you cling to them where you find them." "This impressive book [is] an elegantly written argument in favour of a conservative alternative to the hitherto unchallenged (saysTate) groupthink of liberal educators. Here is someone willing to promote a thoroughly unfashionableand unpopular view of education, someone who is – to quote the book’s subtitle – prepared to go ‘against the current’." 8. Whatever happened to education for a Christian society? Nicholas Tate was Chief Executive of England’s School Curriculum and Assessment Authority and its successor body the Qualifications and Curriculum Authority, during the years 1994-2000. Since 2000 he has been Head of Winchester College (2000-3) and The International School of Geneva (2003-2011), as well as of a global network of schools. He chaired the International Baccalaureate’s Education Committee for five years and served on the French Education Minister’s Haut Conseil de l’Évaluation de l’École. He has a doctorate in history and has written extensively on history and education. The Routledge Research in Education Policy and Politics series aims to enhance our understanding of key challenges and facilitate on-going academic debate within the influential and growing field of Education Policy and Politics.